I spent a lot of time looking for modern, quality chairs and I found them! Absolutely love these chairs, great price, great quality! 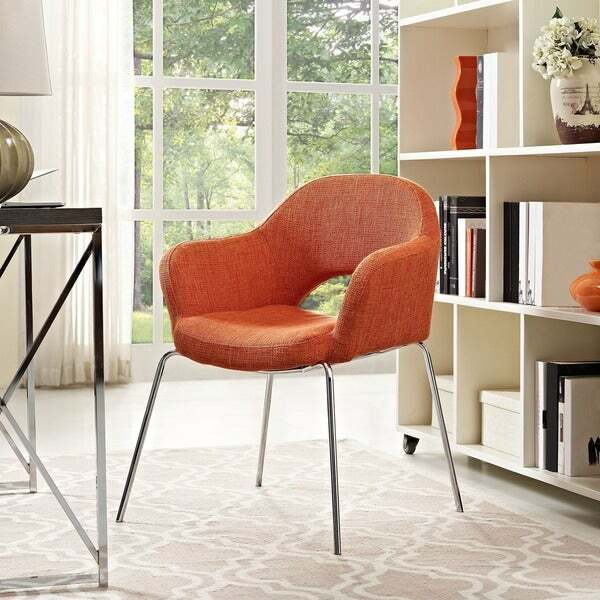 Comfort combines with solid form in this Saarinen-inspired Imbue Arm Chair. Sleek chrome legs support upward surging arms and dual-tone tweed fabric cushions in the best of modern meets retro. This item is a high quality reproduction of the original. The chairs look nice, but the material doesn't seem great. After just over a year, the cushion is also no longer comfortable. We are looking for a replacement. Not even that cheap. I have bought equivalent chairs from Overstock at similar price and much higher quality. Would not recommend. The fabric is totally falling apart and it hasn't been even a year. The sit is a bit too tall for me, but the chair is comfortable. Unfortunately, poorly made. I will be making an slip cover for it soon. "WHAT IS THE HEIGHT FROM THE TOP OF THE ARM TO THE FLOOR?IM USING THIS AS A DESK CHAIR AND I NEED IT TO BE ABLE TO GO UNDER DESK"
Hello Valued Customer, the height from the top of the arm to the floor is 25 inches. The total height is 31 inches, and the seat height is 19 inches. The width of the chair is 25.5 inches, and from back to front, the depth of the product is 24 inches. I hope this information is helpful. Thank you for shopping with us! "is the seat height really 21"? That is pretty unusual and the red chair says 17.75" seat height." Another site states that the height is 19 inches.